Geneva, Switzerland - September 5th, 2016 – MSC Cruises — the Swiss-based world’s largest privately-owned cruise line and market leader in Europe, South America and South Africa — today announced a further addition to its family-focused offerings, this time with a new range of fun kids’ activities and supporting web series, “Kelly & Kloe On Board.” After a landmark year of enhancements and expansions to family entertainment, the new onboard experience will also engage younger guests through an accompanying web series, so that the fun can start prior to the cruise holiday and continue well after disembarkation. “We’re very excited about launching this new experience for kids and their families both on and off-board. It really brings to life our commitment to providing our youngest guests with original entertainment products that are delivered to them in a unique and exciting way”, explains Matteo Mancini, MSC Cruises’ Children’s Entertainment Manager. 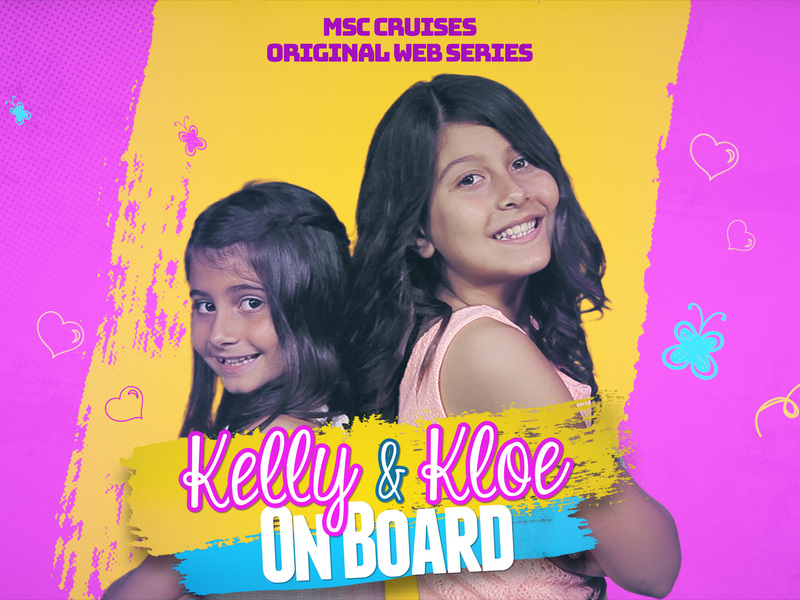 The “Kelly & Kloe On Board” experience day will be rolled out across the MSC Cruises fleet this month and follows the story of two young girls – Kelly and Kloe – who spend time on board an MSC Cruises ship alongside their father - the Master. One day, despite promising him an afternoon of quiet study in their cabin, the girls embark on an adventure filled with fun and mischief with their longsuffering butler and two cruise staff members in tow. During their adventure throughout the ship, they experience magic, videogames, 4D movies, a water-slide, sports and dances with endless costume changes. The web series, which kids can watch on the MSC Cruises website, features in its first season four three minute episodes that the kids can watch before they go on their holiday or once they return home -- to relive the fun that was had on board. The new entertainment offering was developed by MSC Cruises’ entertainment team, working in cooperation with seasoned professionals from the world of TV and musical theatre to bring to life the story of “Kelly & Kloe” also through the web series. MSC Cruises already offers a rich variety of family offerings across its fleet including a collaboration with the LEGO Group. The LEGO Experience on-board is a whole day on every cruise itinerary that is dedicated to fun LEGO® activities, which culminates in the children receiving a Jr. LEGO® Master Builder diploma. Other recently launched kids’ activities include the sports programme, DOREBRO and an interactive cooking class, designed with Michelin-starred chef Carlo Cracco. A range of services is also provided for babies and young children including the Mini-Club for children under 3 as well as a dedicated childcare service giving parents the freedom to enjoy the ship, safe in the knowledge that their children are being cared for by dedicated and highly trained staff. Many of these services are offered in collaboration with Chicco® – the leading global baby brand and yet another exclusive MSC Cruises partnership. In addition, MSC Cruises ships feature latest-generation and fun-filled onboard facilities such as aqua parks and pools, bowling alleys and 4D cinemas as well as dedicated shore activities designed with the needs of the entire family in mind.